Tech and gadget news. News related to Google, Apple, Microsoft, RIM, Facebook, Android, iOS, Blackberry, Windows Phones and more! The Samsung Galaxy Tab 10.1 tablet will finally go on sale in Australia on today thanks to a decision made by the country's highest court last week. The Register reports that the Australian High Court has ruled that last week's lower court ruling that overturned the sales ban on the tablet will stand, despite an appeal by Apple that it be reinstated. The injunction against the sale of the tablet, which had been in place since August, was due to Apple's claim that Samsung's Galaxy Tab 10.1 tablet violated Apple's patents that it holds for its iPad tablet. Last week, the three judge panel in the Federal Court of Australia unanimously overturned that previous court ruling. Apple appealed that decision to the Australian High Court but today that court ruled that Apple didn't have enough of a chance for their appeal of the injunction to succeed. 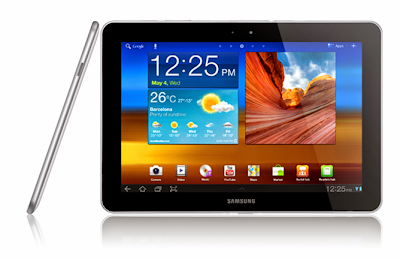 Samsung has already said the Galaxy Tab 10.1 will go on sale Monday in Australian stores. The 16 GB WiFi Galaxy 10.1 Tab will be priced at $579 while the 3G version of the tablet will be sold for $729. The patent court battle between Apple and Samsung isn't over yet in Australia. The hearing about the patent infringement case will be held sometime in 2012. [Actualizado] Video filtrado del rediseño de Gmail! I do not take any kind of credit for any of the images or videos exposed in this site. I just made this to Spotlight and share technology news, app reviews and soccer news from all around the web under MY OWN CRITERIA. Additionally, sometimes I like to make some gadgets and technology recommendations and reviews. I hope you all Like it!